... as in, Keep it Simple, Stoopid. This lovely organic ring was designed with Geordie, for his Emma. It went through many incarnations before getting to this... all much more fiddly and intricate. 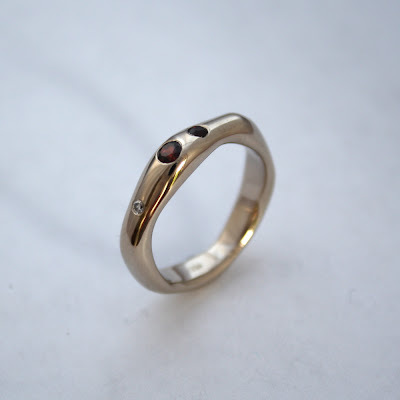 After bouncing back and forth for a couple of months, we agreed to pare it back to a simple, clean, wonky form, featuring mismatched garnets and diamonds. My first instinct is always to add detail upon gilded detail (maybe it's my italian genes? ), layer upon layer upon layer (wasn't that a Sarah-Lee commercial in the eighties?). This ring was a nice reminder to, well, KISS. Ten points to me for keeping this post Valentines' appropriate!